We open the site "Ukrainian neurological journal" whose was found by O. O. Bogomolets National Medical University. Over the years the journal became a place for discussions, exchange of experiences, views, observations and developments. Today it is a neurological anthology, bringing together various aspects of neurology and neuropathology: fundamental experimental research in the field of neuroscience, lighting promising directions for the diagnosis and treatment of neurological diseases, lectures on various aspects of neurology, clinical observations, and the like. Ukrainian neurologists have long combined work together to assist the neurological patients, working meetings scientific workshops and scientific congresses. "Ukrainian neurological journal" is another opportunity to work together. 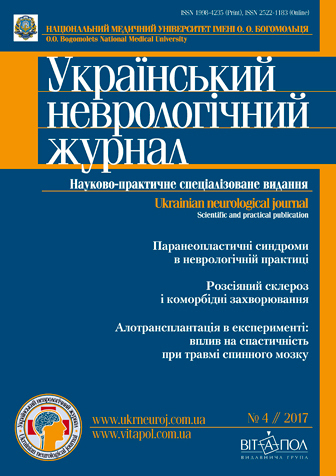 We invite neuroscientists, clinicians, and researchers working in the field of neuroscience to effective cooperation, sincere communication and new discoveries on the pages of "Ukrainian neurological journal".